I started running in June 2012 and ran my first race in February 2013. 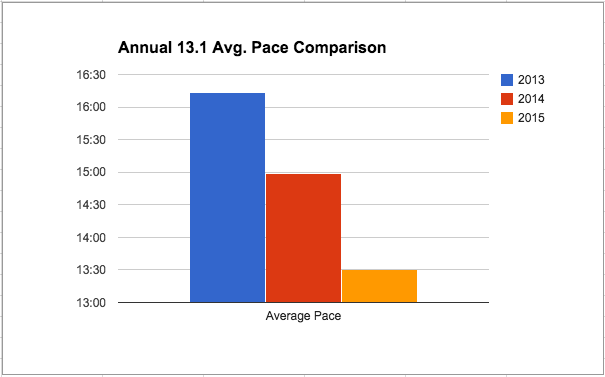 I’m not the world’s fastest runner, but I train hard and have been steadily improving my distance and paces! Here’s what I’ve accomplished so far! 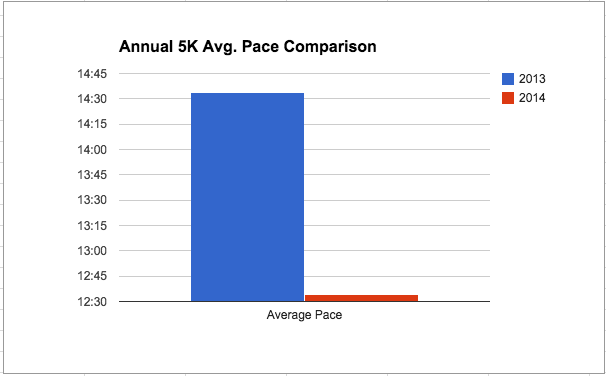 Since I ran my first 5K in Feb 2013 I’ve decreased my overall race time by 8 minutes and 53 seconds and I have decreased my average pace by 3 minutes and 23 seconds! (I’ve yet to race a 5K in 2015). My first 5K was run at a 15:34 minute per mile pace and my most recent 5K was finished at an average 12:12 minute per mile pace! Since I ran my first half marathon in Nov 2013 I’ve decreased my overall race time by 38 minutes and decreased my average pace by 2 minutes 43 seconds! My first half marathon was run at 16:13 minute per mile pace and my most recent half was finished at an average 13:30 minute per mile pace! I’ve only run one full marathon so far and the day was full of trials (as I’m sure everyone’s first marathon is). I’m looking forward to running a quality second marathon this fall in Chicago! All of these times are a work in progress! I hope you’ll subscribe to my blog and follow along on my journey towards becoming the best runner I can be. Tweet me or leave me a comment on Insta or FB to say hi anytime! That’s great! It is really inspiring. You have achieved a lot in short time. Enjoy your run for more years to come. This is so incredible – running takes incredible discipline and mental strength. I think it’s a great idea to track your times and encourage yourself to improve. Your commitment to improving is inspiring. Congratulation on improving your race times. Run on, friend!